Branded SURFORMA®, the HPL is manufactured by Tafisa’s sister company, Sonae Indústria de Revestimentos (SIR). It is a complete, harmonized line of HPL to our TFL Prelude and Sommet embossed in-register (EIR) Series. Includes one stop shopping for our TFL, HPL & PB with matching complementary products (such as edgebanding) throughout our distribution network. Tafisa® decorative panels and matching high-pressure laminates are offered exclusively through Tafisa®'s distribution network. Click here to view the full list of Tafisa® decorative panels and matching Surforma HPL. 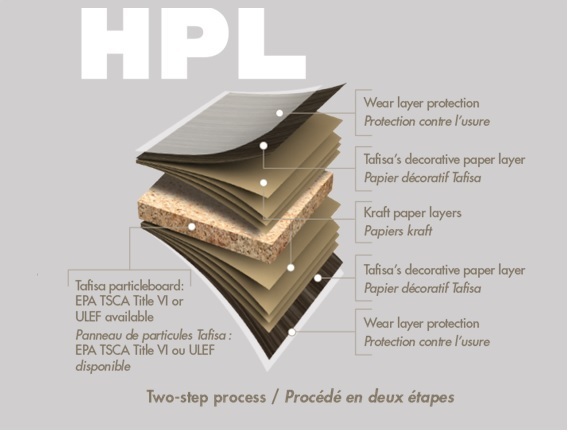 HPL panels are manufactured in two steps. The first consists of thermofusing the wear and decorative layers to multiple layers of kraft paper to form a single laminated sheet. Steel press plates are used to create the surface texture. The sheet is then bonded to a substrate (particleboard, MDF or other) by the end-user to create a finished product.